"The firefighter afloat. Dressed in an asbestos suit and equipped with a special spray outfit ready to fight any fire." 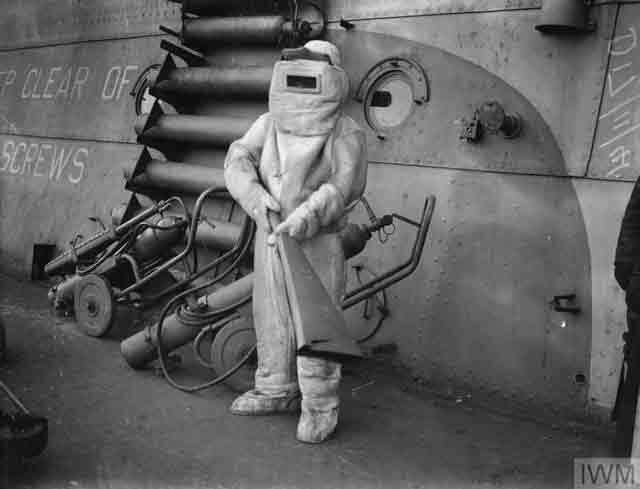 This photograph was taken on board HMS Victorious, 16 or 17 November 1941. © IWM (A 6406). Eastern Front: General Erich von Manstein's 11th Army completes its conquest of the bulk of the Crimea on 16 November 1941 by capturing Kerch. The Soviets have held out hope that they could retain the Kerch peninsula in the far east of the Crimea as a springboard to relieve the trapped forces at Sevastopol in the extreme west of the Crimea. However, their forces retreat in disarray across the Kerch Strait to the Caucasus. Soviet Deputy Navy Commissar Admiral Gordey Levchenko is blamed for the loss and arrested. He will be sentenced to 10-years imprisonment in a labor camp for the loss on 26 January 1942. However, other admirals will step forward in Levchenko's defense, and his punishment will be changed to a temporary reduction in rank to captain 1st class and eventual (in 1944) reinstatement of rank. 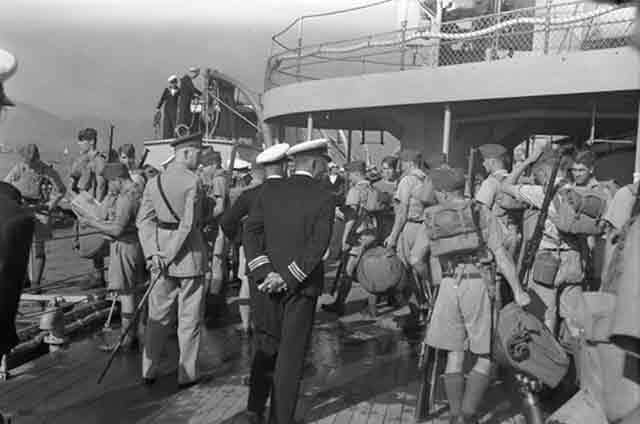 Infantrymen of "C" Company, Royal Rifles of Canada, disembarking from H.M.C.S. PRINCE ROBERT, Hong Kong, 16 November 1941 - Canada. Dept. 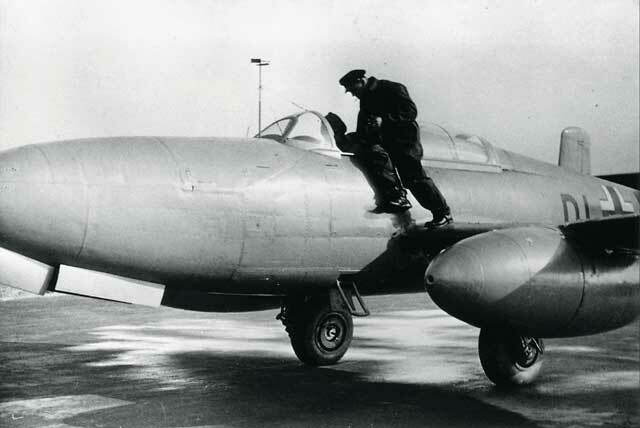 of National Defence / Library and Archives Canada / PA-114820. Another 1825 men arrive on the same day aboard troopship Awatea from Vancouver. 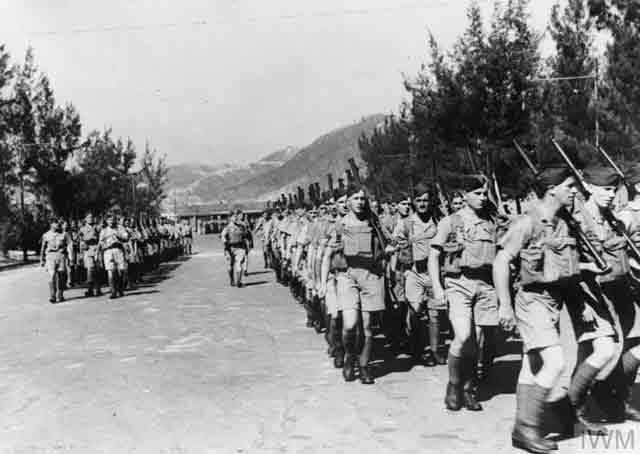 Together, the men march to the Shamshuipo Barracks in Kowloon as cheering crowds lined the streets waving Union Jacks. The troops are mostly members of The Royal Rifles of Canada, a unit made up mainly of soldiers from Quebec and New Brunswick, and Western Canada's Winnipeg Grenadiers. Manstein's occupation of the eastern end of the Crimea creates the appearance of a solid front that runs almost due north from Kerch through Kharkov and Moscow up to Tikhvin, where it veers east to Leningrad. This is somewhat misleading, as the Wehrmacht usually advances only along main roads and never sets sight on vast stretches of territory. The Red Army is counterattacking along most of that line, but with little success at the moment. The German resumption of Operation Typhoon shifts into high gear today. East of Volokolamsk, a powerful Soviet counterattack by five cavalry divisions and a tank division of 16th Army runs into the German advance by Fourth Panzer Army and disintegrates. The counterattack is not without effect, however, as the fierce fighting (one Soviet tank brigade is reduced to two "runners") further weakens panzer units that are fighting both the Soviets and the weather. On 16 November 1941, construction begins on the future U.S. 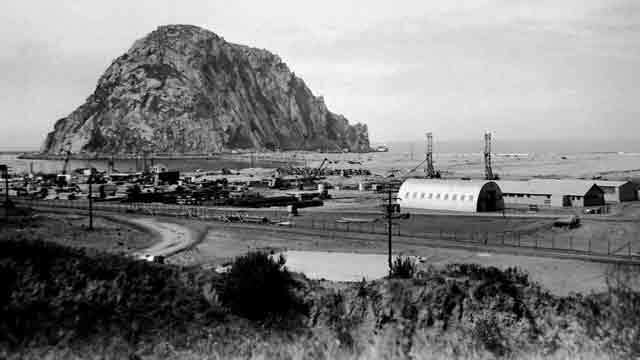 Naval Amphibious Training Base at Morro Bay, which is pictured here in 1946. The site was later used for a power plant (NEIL KLINE-HISTORICAL SOCIETY OF MORRO BAY). General Hoepner, commander of Panzer Army 4, successfully opens a wedge between Soviet 5th and 30th Armies and reaches the Volokolamsk-Moscow highway at Dubosekovo. This is a dangerous development and is exactly what General Guderian is attempting to do south of Moscow at Tula - without success. The Soviets later attempt to create a legend about this battle, "The Testimony of the 28 Fallen Heroes," in which 27 men (after shooting one coward) destroys 50 panzers before all are killed valiantly in combat. This appears to be pure propaganda. In fact, a couple of the men survive and become POWs and another dies later in a Soviet hospital, though the NKVD does indeed later arrest one of the survivors - as a deserter. The regimental commander himself isn't even at the battle and learns about his deeds of bravery from journalists. 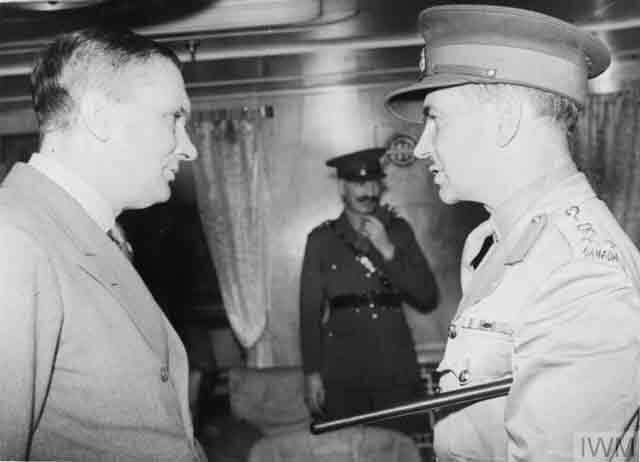 "The Governor of Hong Kong, Sir Mark Young, talking with the Officer Commanding Canadian troops. (Ottawa originally revealed on November 16 the arrival at Hong Kong of Canadian reinforcements, making a formidable garrison of Canadian, British, Scottish and Indian regiments, with a battalion of Chinese)." © IWM (K 1373). Many of the German generals don't agree with the strategy to continue pushing east as the weather worsens, and this manifests itself in ways that will recur throughout the remainder of World War II. General Adolf Strauß, commander of 9th Army northwest of Moscow, is one of them. Complying with the orders issued at the Orsha Conference on 13 November, Strauß commits three divisions to an attack between the Ivankovo Reservoir (aka Moscow Sea) and the Volga Reservoir without any plans to reinforce them. Strauß, like other commanders, sees no point to further minor advances that will just leave his lightly clad men exposed to both the elements and certain Soviet counterattacks. "Canadian troops (Winnipeg Grenadiers or Canadian Royal Rifles) marching into their new camp on arrival at Hong Kong, 16 November 1941." © IWM (K 1385). Near 9th Army northwest of Moscow, Panzer Army 3 under General Georg-Hans Reinhardt secures a crossing over the Lama River on the way to Klin. This is accomplished due to heroic exploits by a motorized infantry regiment of 7th Panzer Division. This is led by Hasso von Manteuffel, who will receive the Ritterkreuz (Knight's Cross) for the feat. Manteuffel personally enters a Soviet power plant that supplies power to areas yet to be conquered and turns it off. Manteuffel's victory is extremely dangerous for the Soviets, opening a clear path to the city itself which Manteuffel and the rest of 7th Panzer Division are capable of exploiting unless the Red Army quickly shifts in reinforcements. 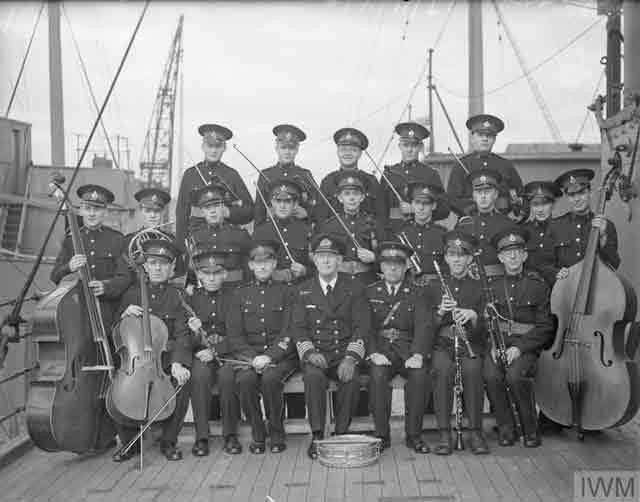 "The Royal Marine Band of HMS COCHRANE. Captain Cyril H G Benson, DSO, RN, (Rear Admiral ret'd) of HMS COCHRANE is seen in the center, with Captain P T Taylor, RM." Rosyth, 16 November 1941. © IWM (A 6290). Overall, the German progress on 16 November is satisfactory in terms of the hopes placed in it by the high command. New opportunities are created, particularly at Klin, and the Wehrmacht retains an outside chance of advancing into Moscow itself by the end of the month. The frozen ground restores the German mobility and to some extent makes it easier to transport supplies. However, the Soviets, for the most part, continue to hold the places they need to, such as Tula, and German hopes of a general breakdown in Soviet morale are not coming true. 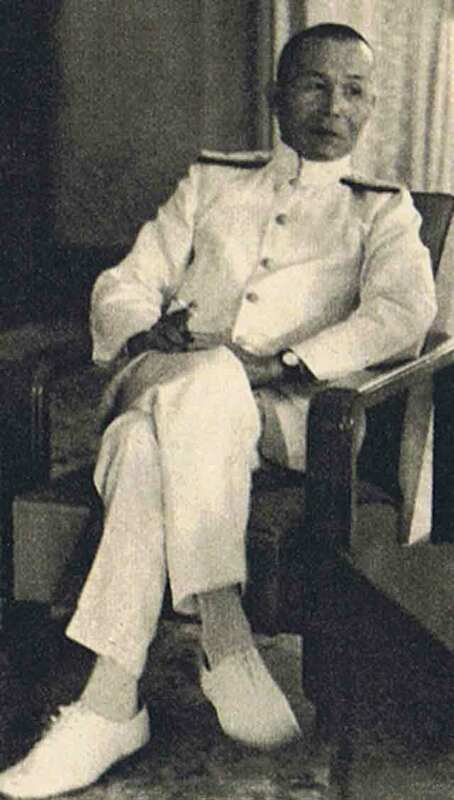 Vice Admiral Jisaburo Ozawa, commander of the Japanese Navy Southern Expeditionary Fleet, in Saigon, French Indochina on 16 November 1941.